1 of 3 Brush chicken with 1 tablespoon vinegar. Sprinkle with Italian seasoning, 3/4 teaspoon salt and 1/4 teaspoon pepper. 2 of 3 Heat 1 tablespoon olive oil in large nonstick skillet over medium-high heat. Working in batches if necessary to avoid crowding skillet, add chicken to hot oil; saute about 6 to 7 minutes per side or until browned (170 degrees F). Remove chicken to platter; keep warm. 3 of 3 Add remaining 3 tablespoons vinegar to skillet over medium heat, stirring with wooden spoon to loosen any browned bits from bottom of skillet. Add remaining 2 tablespoons oil, 1/4 teaspoon salt and 1/4 teaspoon pepper to skillet. Stir in tomatoes; heat through. 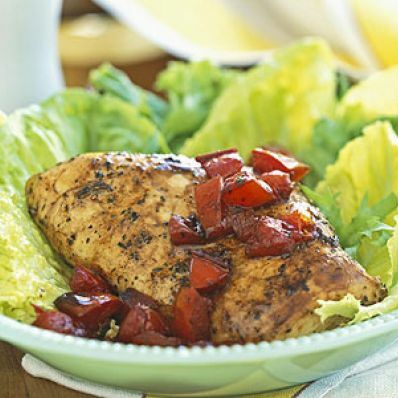 Pour warm vinaigrette over chicken. Serve with mixed greens, if desired. Per Serving: 650 mg sodium, 2 g fiber, 13 g Fat, total, 8 g carb., 24 g pro., 247 kcal cal., 2 g sat. fat, 63 mg chol.